The next morning Q and I went to the local Farmer’s Market. Along with the Vegetables and Fruit that I had purchased we also had some Tamales from the Tamale Vendor that frequents all of our local Farmer’s Markets. Uh Oh! Monti wanted to know why we didn’t let him know. Oh Well! Since he and Kratae elected to stay at his Brother’s house which was about 8 miles from us, we couldn’t go pick them up, go back to the Farmer’s Market, and then return home with the Vegies. Besides which, they wouldn’t have been ready when we went. After we took the produce home we then went and picked up Monti and Kratae and drove to the Valley. A visit to Walmart (their request) to purchase some items unavailable where they live, to take back home (abroad) with them. 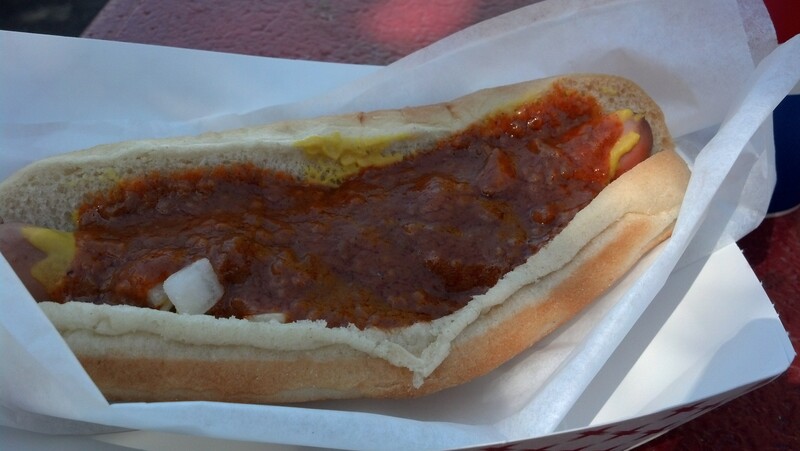 After our Walmart visit, we drove to Cupid’s Hot Dogs in Canoga Park. This was one of their childhood and teen/young adult favorite places to get Hot Dogs. 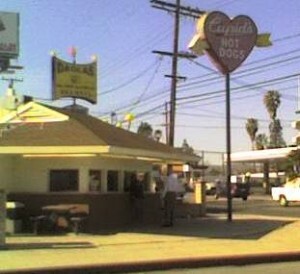 Cupids does not have the best Hot Dogs, but they are ‘good’ and there is a certain nostalgia attached to the place. When my parents and brother and I moved to the San Fernando Valley, the original Cupids (in North Hollywood near Lankershim Blvd.) was one of the first places that I noticed and never forgot. Never ate there as a child but did take my kids to the one in Van Nuys on Victory Blvd. and later on I ate a lot of Hot Dogs at Cupids in Northridge, across from Cal State Northridge where I returned to school to complete my degree and teaching credential. 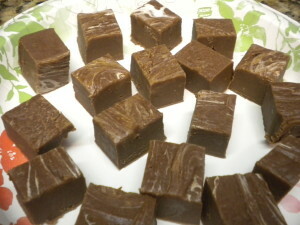 I love Cupids; we all love Cupids! 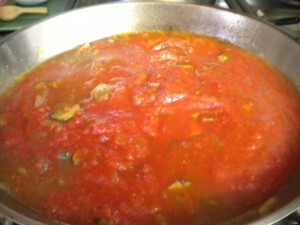 For dinner we returned home where I had Pizza Dough ready and waiting to be dressed and baked. We had a Pizza Prepping Party; Monti’s request was for Anchovies, Pepperoni and Jalapenos and I let him dress his own. Kratae’s was for Hawaiian Pizza. Normally I put Portuguese Sausage on Hawaiian Pizza but the market we stopped at didn’t have it, so we used the typical Canadian Bacon instead. 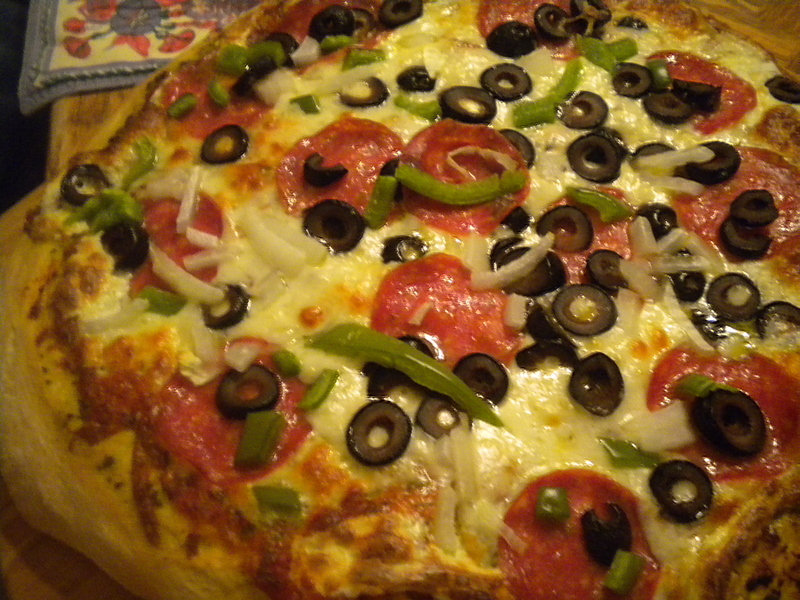 My husband Ev wanted his normal Pepperoni Pizza and of course I put lots of Mushrooms, Olives and Bell Peppers on it as well. Quinn and David were happy to eat all the varieties that had been made. I also made a Caesar Salad to go with the Pizza. 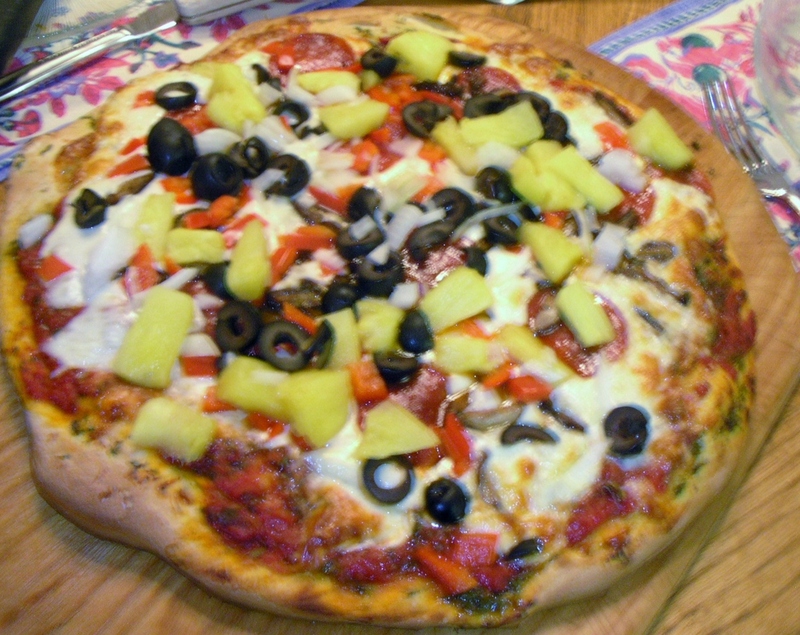 For Hawaiian Pizza just add some Portuguese Sausage (cooked) or Canadian Bacon Slices, Pineapple Wedges, (fresh or canned) and some Black Olives and Green or Red Bell Peppers. The next day, Sunday, my son David who is a Real Estate Agent had a unique ‘Open House’ at one of his listings. 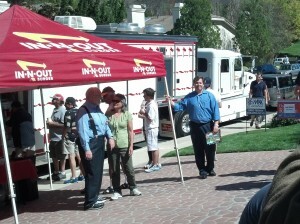 He had engaged ‘In and Out’ to come and serve Burgers to the guests invited to the ‘Open House’. So that is what we did for lunch. Animal Style Burgers, Chips and Drinks. 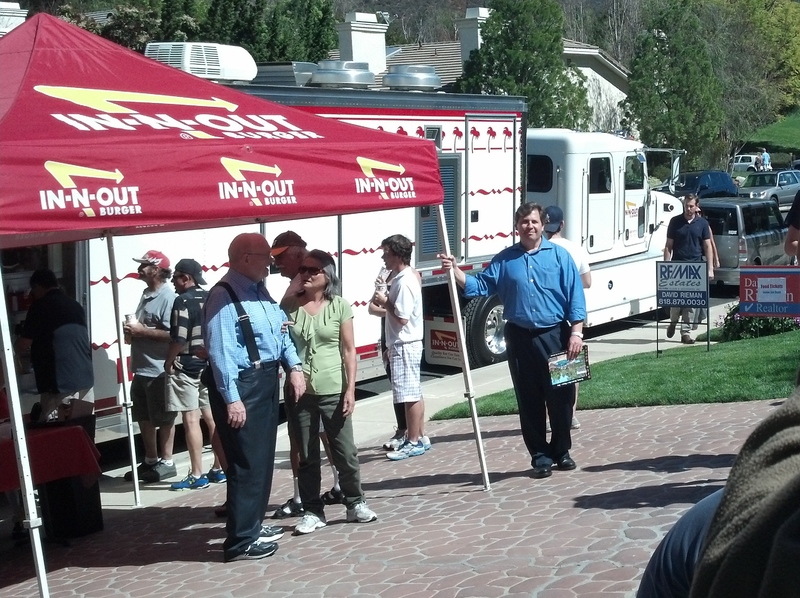 This was a very successful event and over 300 hundred Burgers were served. For dinner that evening, I made Linguini with Mushroom Sauce and a Salad along with an Italian Bread. For dessert, I baked the large Chocolate Chip Cookie that Monti had requested and served that along with the Peanut Butter Fudge that Monti had also requested. It seems that Monti put in all the food requests. Quinn was just glad to eat all these items as these were ones that he loved too.